what's cooking in my tuscan kitchen: What exactly is "authentic" Italian cooking?? What exactly is "authentic" Italian cooking?? Well! A lot has happened since my last blog post in September 2012!! I would like to share a personal note with you before I get to my cooking craziness for the day! I left Italy for the states in early November to spend some time with my Dad and mom. Daddy's health had been failing quickly in the months prior to my trip and every time I would talk to him, he would ask me, "when are you coming?" I really didn't know when would be the best time.. I was thinking about Christmas with the family. Then one day when he asked me when I was going to go "home" for a visit, I said "in the fall, Dad. I'll be there in the fall". I really hate to fly... and I kept putting off purchasing that ticket. I had a knitting workshop planned for mid October and I knew that if I didn't pick my dates soon.... so in mid October, right before leaving for the workshop I got online and purchased my tickets, with a departure date of November 8th. I really didn't pick that particular date.. I just put in the first week of November as my departure and the second week of December as my return. Then, with incredible logic ;) I picked the cheapest flight that Lufthansa had! God works in mysterious ways, and most of the time we are not privy to his plans! I was able to spend about 2 months with my Dad and mom. When I saw that Dad was failing fast, I changed my return flight so I could be with him and my mother as long as they needed me. Daddy went "home" to his Father on December 18th. Had I waited for Christmas I would have missed out on a couple of great months with my parents. Mom came back to Italy with me in mid January and we continued our mother-daughter visit on into mid February. One of the things I enjoyed doing most with my mom was going into town every morning to "shop"... we would go to the green grocer and look at what was available, build our lunch and dinner menus around what we saw there. 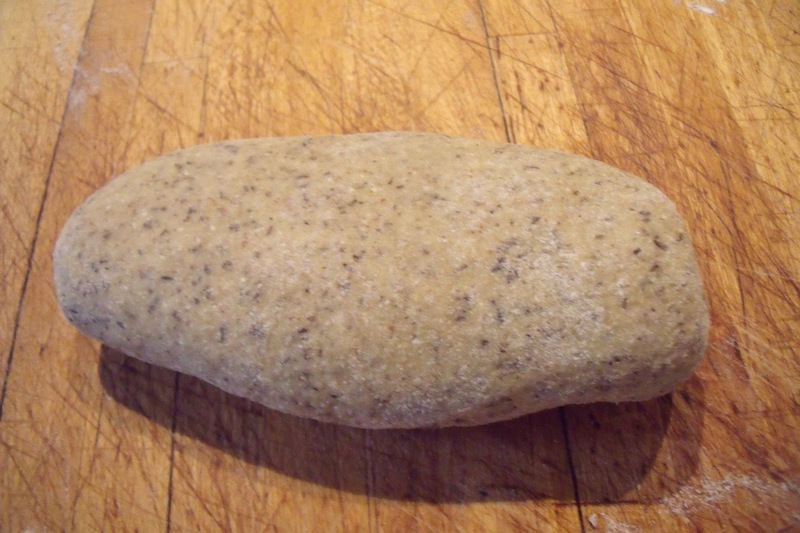 Then off to the baker for some fresh bread, then maybe some fresh pasta and so on. So you see in the end this little personal note of mine ties in with my question: "what exactly is "authentic" Italian cooking?" I am by no means a food snob! However... authentic is a hard word to use when describing an ethnic recipe. Let's take Pasta alla Carbonara for example. How do you fix it? Bacon, onions, cream, eggs, cheese? or maybe just bacon no onion, white wine, eggs cheese? However you fix it, I am willing to bet it is a far cry from the "authentic" recipe, which is often contaminated even in Italy! I don't want to write a treatise here on pasta alla carbonara.. so suffice it to say that the recipe probably originated among the "carbonai" from the Lazio region of Italy. The carbonai were men who went into the hills, collected wood, made carefully constructed mounds out of it which then then allowed to burn very slowly to make charcoal. this was a long process and they would spend weeks or even months away from home. Their food was very simple and based on whatever they had with them, usually eggs (they probably brought chickens with them for the eggs), guanciale (a cured fatty meat made from pig's jowl) conserved with salt and black pepper, "cacio" (a sharp, hard cheese made from sheep's milk) and pasta. They would render the guanciale in a frying pan over the fire, boil the pasta; when the pasta was cooked they would add it to the pan with the guanciale, crack a couple of eggs over it, add a good grating of "cacio" - toss and eat. A far cry from the not so authentic dish proposed in the menus of many "authentic" Italian restaurants! Well, today... I made a not so authentic, but very Italian pasta and beans dish (pasta e fagioli). 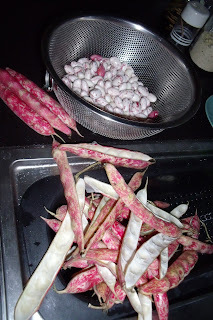 I found beautiful fresh borlotto beans at the grocery store this week (mom would call them "fagioli della Regina" - the queen's beans, a colloquial name for this variety of borlotto beans). The price was right, they are delicious and nutritious.. so into my cart they went! 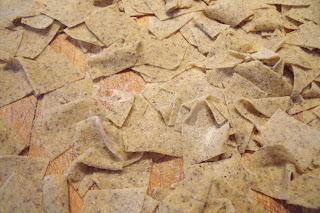 Today I decided to make them with "maltagliati" - a homemade pasta that you cut with a knife into little squares or diamonds without the aid of a pasta cutter, hence "maltagliati" or... poorly cut! I have always seen this dish made with onions, beans and tomato sauce. 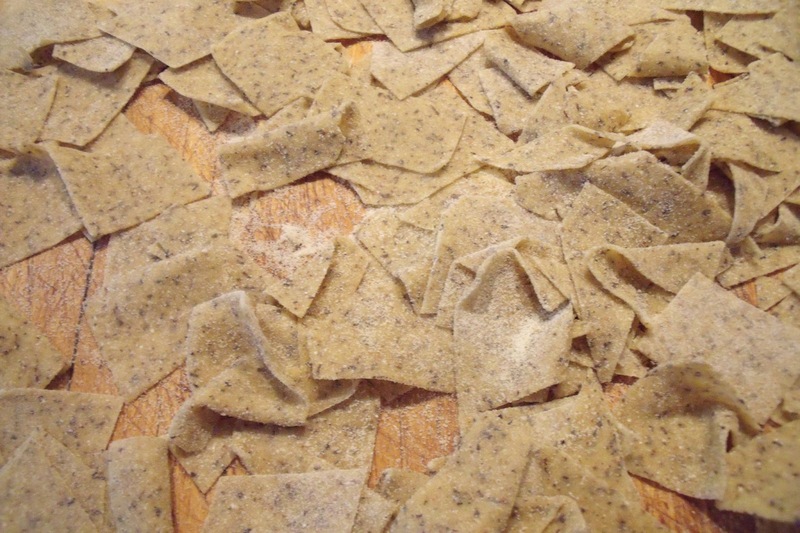 The pasta is usually the typical egg pasta, cut by hand into diamonds. 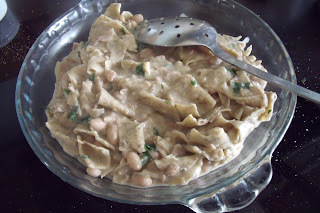 But I prefer my beans "in bianco" or white, with no tomato and I love pasta made with buckwheat flour! So here goes my not so authentic, but very Italian pasta and beans recipe! 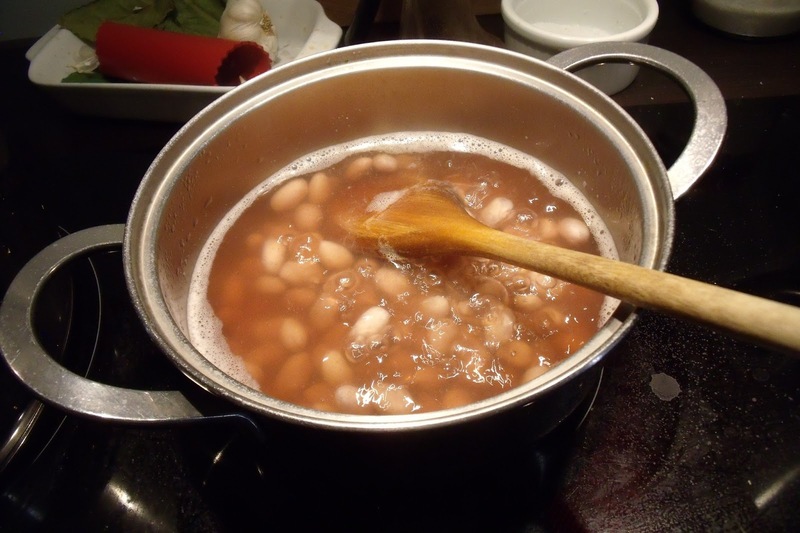 Shell the beans and put them in a pot with enough water to cover them by about 2 inches. Salt the water to taste, bring to a boil and cook for about 30 minutes or until you can squash a bean against the side of the pot with a wooden spoon. When the beans are cooked, add salt if needed, add the garlic cloves, peeled but not cut, 2 or 3 tablespoons of olive oil. Cover and set aside. about 3 to 4 oz. 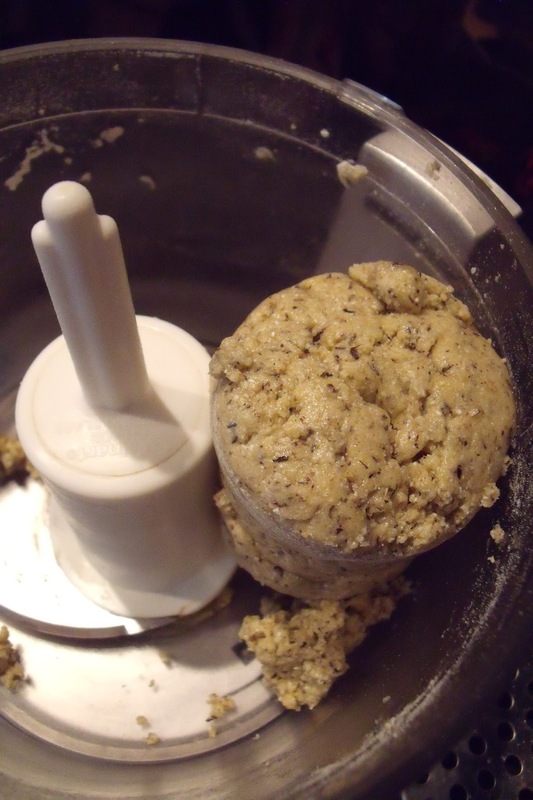 of flour, I used half buckwheat and half white, but if you can't find buckwheat flour you can use all white, or half whole wheat and half white. So, I unauthentically put the flour, egg and oil into my food processor and processed it for about 30 seconds on high. This what your dough will look like, more or less. 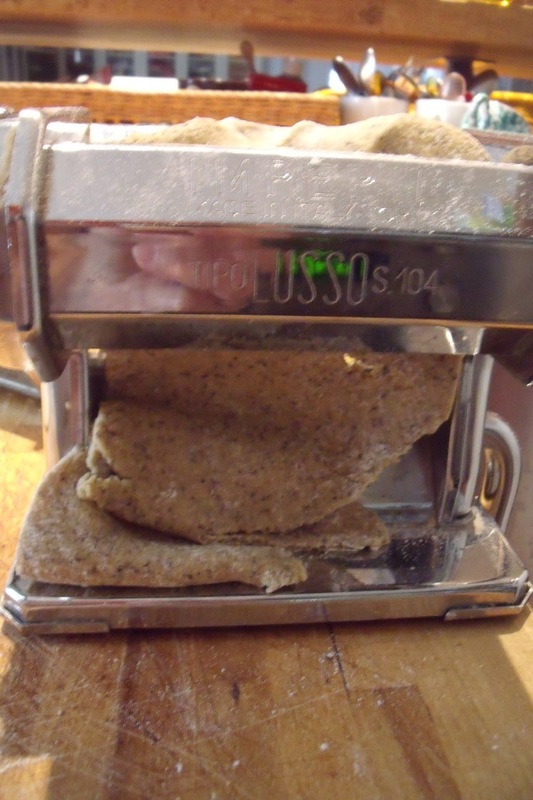 Now use a pasta machine to roll out the pasta. I make mine pretty thin. This is up to you. I don't like my homemade pasta too thick. 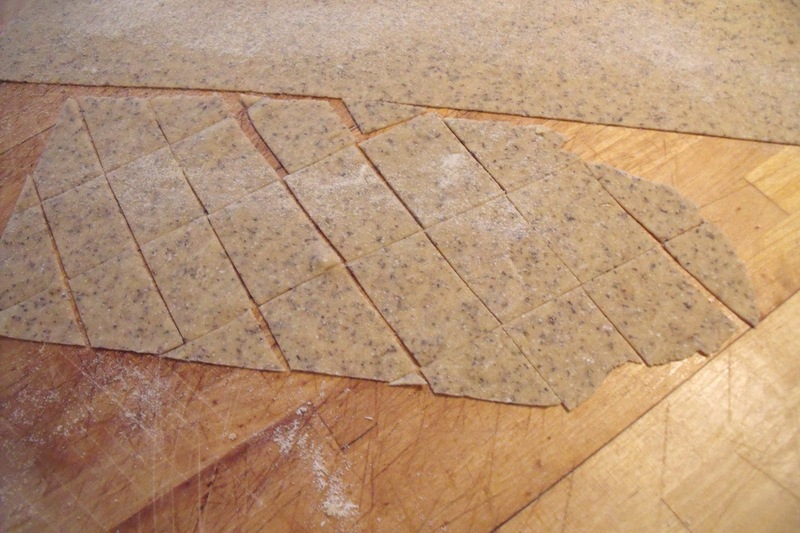 Now you should have sheets of pasta that look more or less like this on your board. 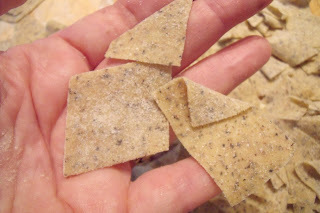 Use a very sharp knife to cut the sheets of pasta into diamond shapes that are about 1.5 x 1.5"
The diamonds or squares should be more or less this size. 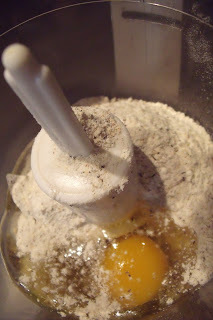 Dust with flour so they don't stick together. Now bring your beans back to a boil. You may or may not want to remove the garlic cloves. i take them out so I don't have to hear someone complain "why do I always get the garlic?!" 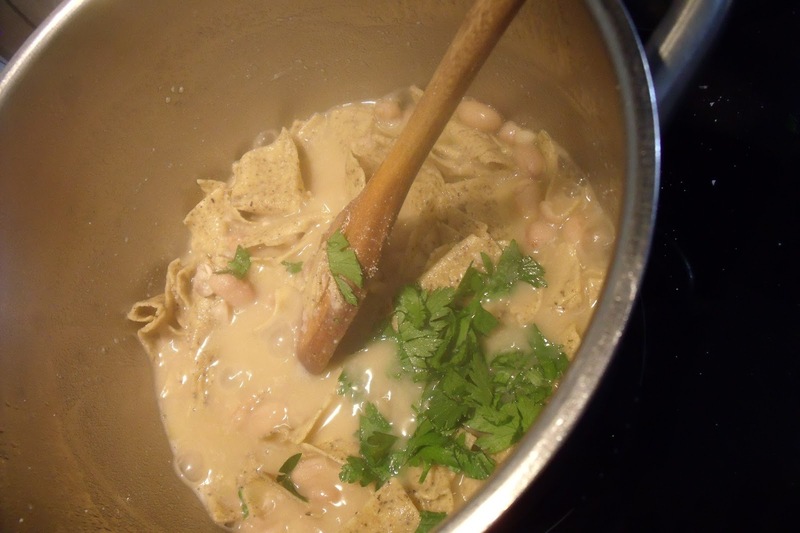 Smash some of the beans against the side of the pot for a creamier consistency. Add just enough water to cover the beans and when it comes to a boil, add the pasta. 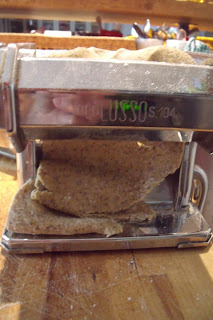 If you use buckwheat or whole wheat flour, you should let the beans and pasta cook for about 4 or 5 minutes. 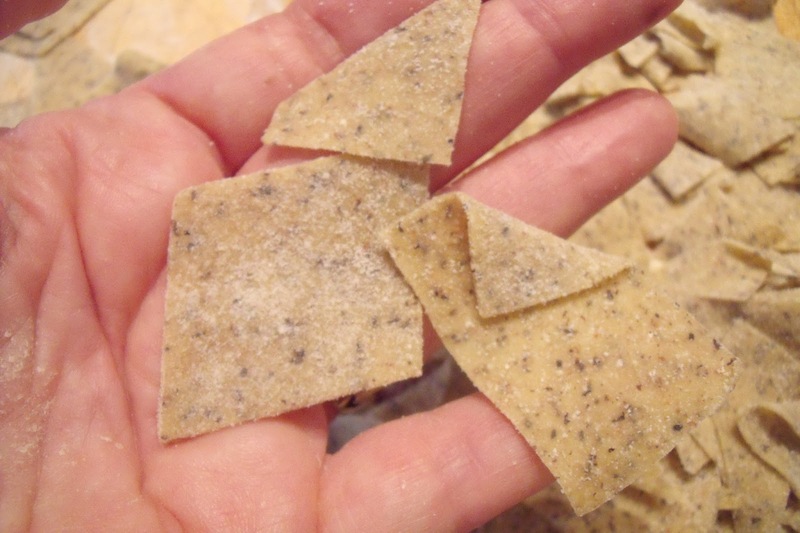 If you use white flour, it should only take a minute or two. Continue to stir as the pasta cooks so it doesn't stick to the bottom of the pot. You may need to add some water if it is too thick or is sticking to the pan. You can make it as soupy or as dry as you like it. We like it creamy but not soupy. 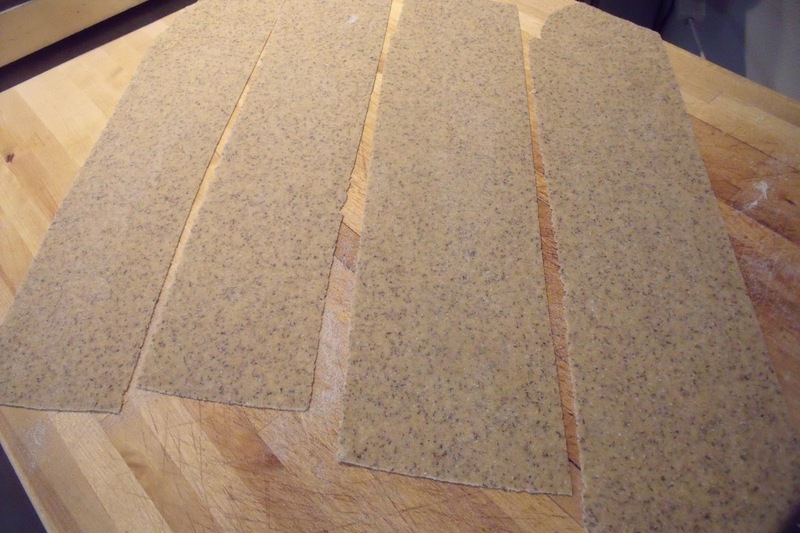 Add the minced parsley. Taste it and correct the seasoning. Serve with a swirl of olive oil and Buon appetito!! Well, the beans and pasta look fantastic. I'm still growing the beans I brought back from Lucca. I think it's primarily the Fagioli Stregoni that are the lovely (and oh, so tasty dry) pole beans. What a special time to spend with your dad and then your mom. I'm glad you went. I miss my mom and worry about times like that. . .
good memories of wine and chit chat with you in Lucca!